Rome Cast Aluminum Stepped Pedestal, Antique, 24"
Place your existing Rome horizontal sundial on a classically-inspired stand using the Rome Cast Aluminum Stepped Pedestal. The square base evokes the Greek columns of antiquity, with stepped detailing for added height and excitement. 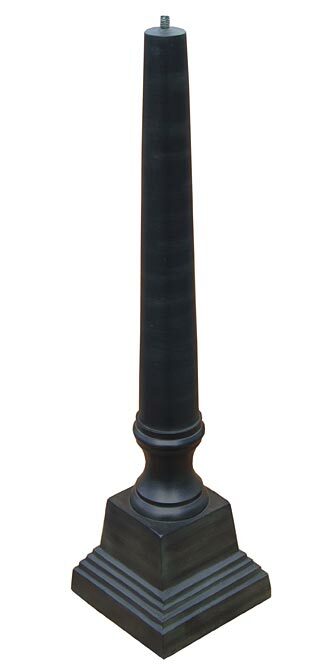 This base leads to a rounded, smooth pillar, which tapers slightly toward the top for interest and design. A threaded screw at the top of the piece accommodates your existing Rome horizontal sundial (not included), and the dark gray hue with soft green hints furthers the antique feel. Crafted from cast aluminum, this unit will surely withstand harsh climates, for a lasting adornment. Create a timeless look in your yard with this Cast Aluminum Stepped Pedestal. Rome Cast Iron Pillar Pedestal, Verdigris, 24"
Rome Cast Aluminum Tapered Pedestal, Antique, 28"
Rome Cast Iron Tree Sundial Pedestal, Verdigris, 16"
Rome Wrought Iron Classic Sundial Pedestal, Black, 28.25"
Rome Wrought Iron Grapevine Pedestal, Gray, 25"